Pumpkin Coffee Cake | Rosetta Bakes! 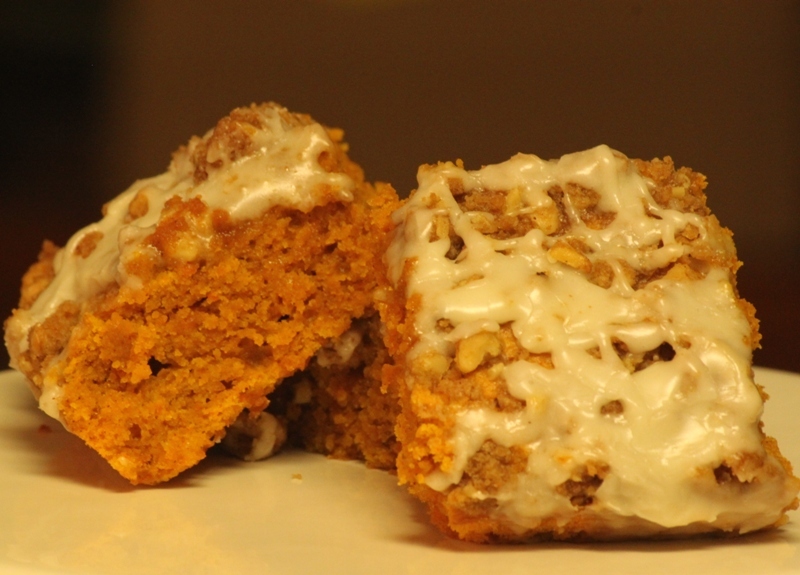 I can tell you now, if you don’t like pumpkin, don’t make this coffee cake! I happen to love pumpkin, especially pumpkin pie, so this recipe was a must for me to make! I was not disappointed, nor were my co-workers, so this recipe is a keeper! I had frozen 15 zip lock bags (the sandwich size) with pumpkin from my Halloween pumpkin! This pumpkin was a Wizard Pumpkin, the kind Cinderella’s coach was made from in the classic animated film by Disney! Anyway, I’ve already made pumpkin bread, pumpkin pies, pumpkin cookies and pumpkin whoopie pies, so I had not made a pumpkin cake. I saw this recipe in a book called : “Make Ahead Meals for Busy Moms,” and thought I’d give it a try…again, not disappointed. This cake is so moist inside, and the streusel topping adds a little crunch to the cake…and then there’s the drizzle icing!! Oh, yummmm indeed! Another great pumpkin recipe to add to my list of pumpkin favorites! Preheat the oven to 350°F. Spray the inside of a tube or bundt pan with nonstick spray; set aside. In a large mixing bowl, beat the butter and sugar on medium speed until well blended. Add the pumpkin and eggs and mix thoroughly. 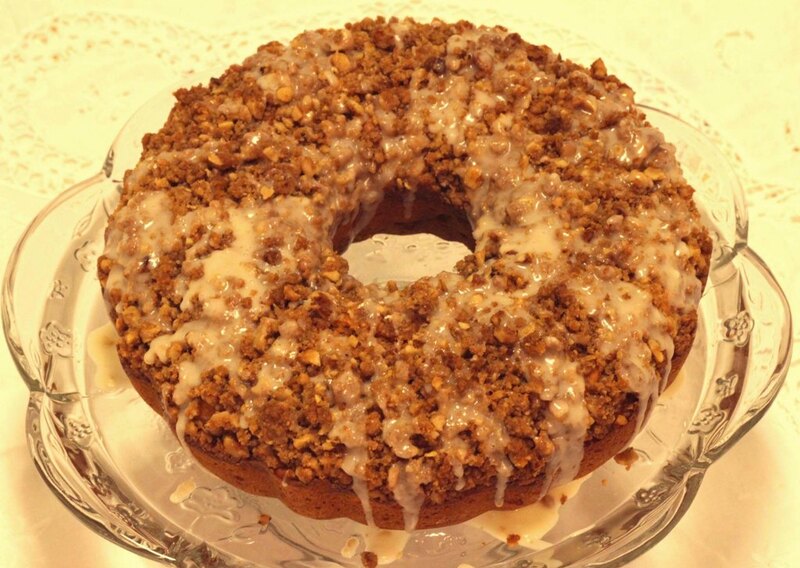 Prepare the streusel topping: In a small bowl combine the flour, sugars, cinnamon, melted butter and walnuts. Sprinkle the streusel over the cake batter. Bake for 50-55 minutes or until a toothpick comes out clean. Cool on a wire rack for about 15 minutes. Slide a knife around the pan so the cake doesn’t stick when removing it. Invert the cake onto a plate. Then invert the cake onto another plate, so that the streusel is on the top. Cool completely. Cover and store at room temperature. In a small saucepan, heat the butter over medium heat until it turns a golden brown, remove from heat. Whisk in the sugar and add cream, one tablespoon at a time until you have icing that you can drizzle over the cake…not too thin, and not too thick. You can also use this recipe to make a sheet size coffee cake. The photo is an 18 x 13 inch cake, and the recipe was tripled to make the sheet coffee cake plus the bundt pan size pumpkin coffee cake. One recipe is all you need for a bundt size cake. For a 13 x 9 inch cake, you may need to double the recipe, although one recipe may be enough. If you double the recipe, you can use any leftover batter to bake a few pumpkin cupcakes! 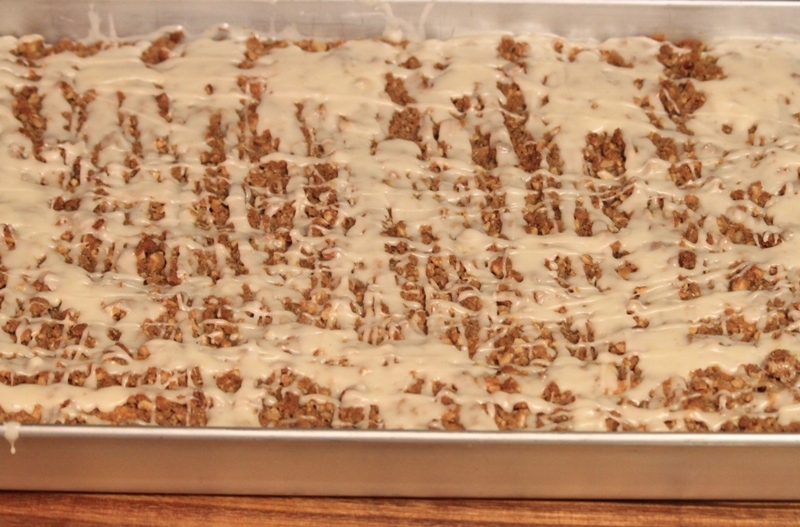 Here is the sheet cake size…again, this is a 18 x 13 inch pan. Darlings, since tomorrow is the first day of fall, it’s high time we review the Autumn “to do” list. Of course there’s getting ready for Halloween, but also picking apples and pumpkins, wearing scarves, taking long walks in long boots, scuffing your feet through fallen leaves, cold hands cozied deep in snug pockets…and, most assuredly, there’s baking to be done – cakes and pies that fill a home with the scents of fall, like a warm exhalation of pumpkin and spice. To celebrate the grad commencement of autumn, here’s a lovely recipe for Pumpkin Coffee Cake from Rosetta Bakes – just the thing to start your fall off on a perfectly sweet note. Mmmn I want a piece!!! Thank you Violet, It’s getting that time of year for fall baking…this will be one I make again soon!